This post is for people taking the Spiky trees class. 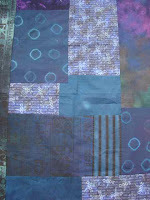 The photo on the left shows a completed cabbage tree quilt with a pieced pale blue background. Any background piecing and arranging should be done before the class as you need a bit of time to get the best arrangement. Piecing the background is purely optional as we will also paint a suitable piece of fabric for the sky or you can use a piece of fabric you already have at home. About 1metre square is about the maximum size that works in a class situation and depends a lot on the size of the tables. This is a dark blue background without the tree fused on top. There are lots of seams but they are mostly covered by the leaves in the finished quilt. Below are fabrics suitable for the leaves of the spiky trees. 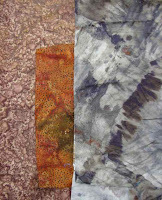 A range of greens can be used including hand dyes and prints. 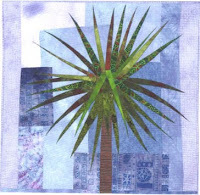 Try to vary the print sizes as using all small print fabric gives the tree a faded look so a few big prints are good. A fabric with a big print in black and white could be painted over with green if you have nothing suitable in green. Inks will be available in class for this purpose. A green fabric with some sort of metallic gold print can look good too. 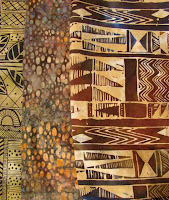 The brown fabrics below are useful for the dead leaves under the cabbage tree or flax as well as for the tree trunk. My apologies to anyone not signed up to do this class who is reading this. I wish more tutors would have helpful information like this available online for their students! don't apologise, the pictures are lovely!